Others were not shocking, but much less positive. 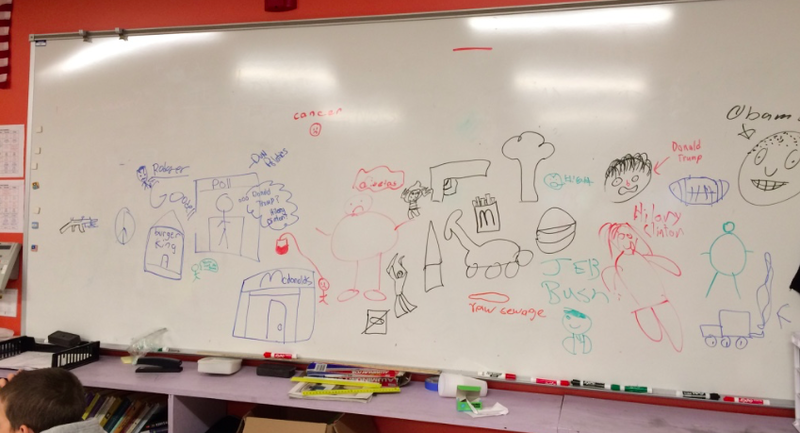 Several students drew guns, beer, fast food, and even obesity. There were other disagreements too. Is a Christmas tree representative of America? What about symbols that Americans have borrowed from other cultures? Even though we associate tacos with Mexican food and fortune cookies with Chinese food, are those American symbols? We had a little time for debate, but one subject we avoided going into too deeply was politics. It was clear that there would be a lot of disagreements if we got discussing this one. But do Obama, Donald Trump, Hillary Clinton, and Jeb Bush symbolize America? Absolutely. We also discussed how in some countries around the world, people can be prosecuted for speaking out against the country’s leadership, but in the United States, we are allowed to say our perspectives freely. Overall, everyone seemed to leave the conversation with some new ideas about what it means to be American. We also discussed how “America” can refer to more than just our country, but many places in North and South America. 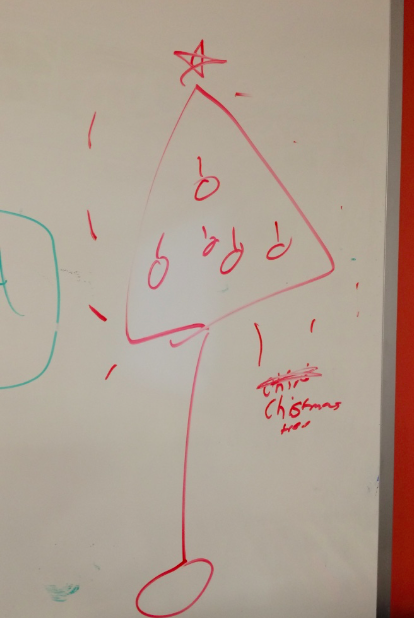 What symbol would you have drawn? 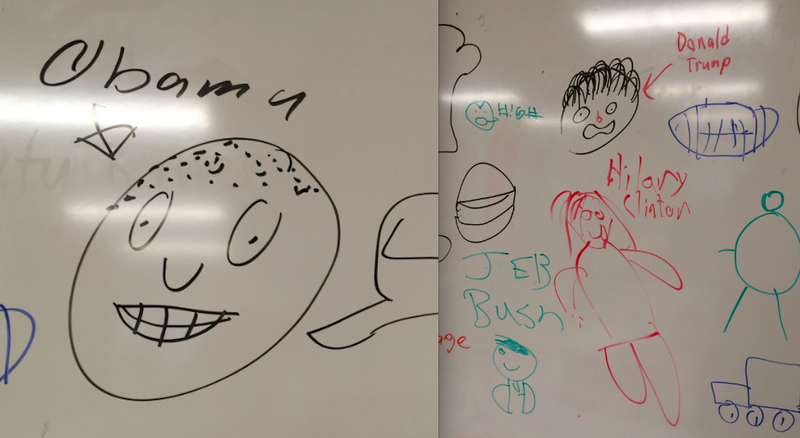 Letting the students draw what their impressions of America are is a great idea! It’s interesting how some students drew pictures of things like raw sewage, beer cans, tacos and fortune cookies. I would have never thought to draw those up there. 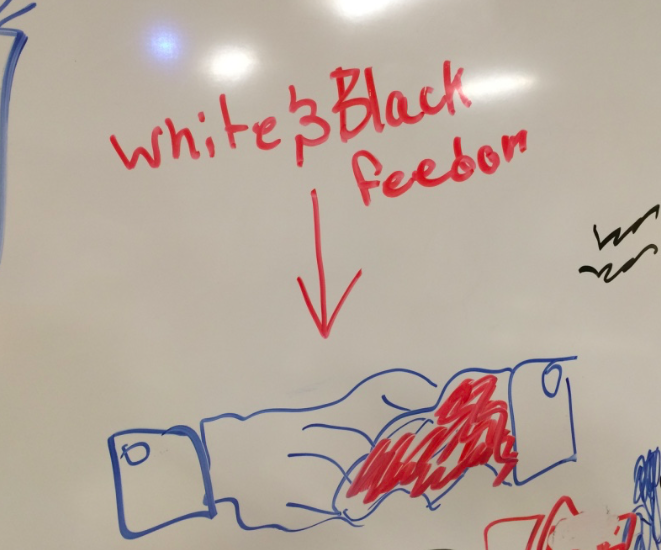 Pictures like these do show the flaws of America, but of course, as shown by the pictures the students drew, there are good things about America too. This activity is a great eye-opener for everyone! Perhaps people should do something like this more often to help solve problems in the world.